KATHMANDU: The Nepal Stock Exchange (Nepse) index extended losses for a fourth consecutive session, dropping more than 11 points, or 0.98 percent, on Sunday. The first trading day of the week was marked by gradual decline of stocks throughout the day. The benchmark index closed at 1,181.66 points. The index failed to find any support on the day as investors lacked confidence to enter the market with conviction. Despite the earning season starting off, only a handful of companies have published their earnings reports for the fourth quarters. Investors are likely to wait for further reports before taking major position in the secondary market. Consequently, the bourse posted a sub-par turnover of Rs 211 million on the day. Most of the key indices reflected the broader equity market. Except Finance Sub-index, all other sub-indices ended the day in red. Significant weakness was visible among Microfinance stocks as its sub-index slid 2.11 percent. Hotel and Non-Life Insurance stocks were also under pressure with their sub-indices closing 1.91 percent and 1.85 percent, respectively, lower. Banking stocks also dropped 0.76 percent. 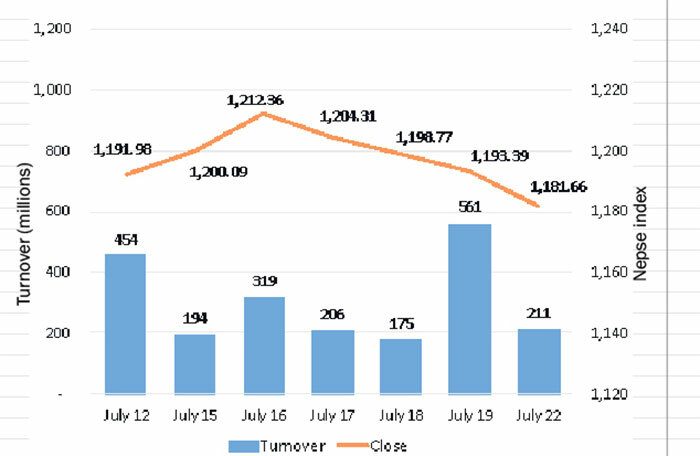 Among active stocks, shares of Nepal Credit and Commerce Bank Ltd were actively traded as it registered total transaction of over Rs 10 million. Naya Nepal Laghubitta Bikas Bank Ltd followed suit with a turnover of over Rs 9 million as the company is closing its book on Monday for 250 percent rights issue. 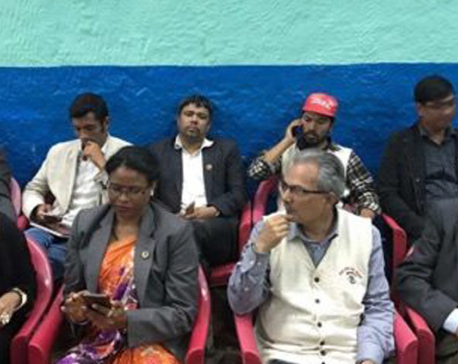 Among others, shares of Citizen Bank International Ltd, Sana Kisan Bikas Bank Ltd and Nepal Life Insurance Company Ltd were also active on the day. In the list of advances, shares of Tinau Development Bank Ltd continued its gaining streak for a fourth straight day as it climbed 6.47 percent on Sunday's session. Similarly, Janaki Finance Ltd surged over 5.63 percent. Further, Radhi Bidyut Company Ltd, Shrijana Finance Ltd and Siddhartha Equity Oriented Scheme saw their share prices add 4.04 percent, 3.31 percent and 3.23 percent, respectively. In contrast, stocks of Arun Valley Hydropower Development Company Ltd was the biggest loser of the day as its sub-index shed 4.82 percent. Shares of United Insurance Company Ltd also came under pressure as it slid 4.23 percent. 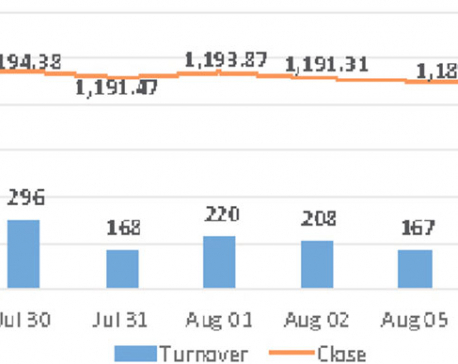 Likewise, Swarojgar Laghubitta Bikas Bank Ltd and Summit Microfinance Development Bank Ltd witnessed its share price skid more than 4 percent each. Garima Bikas Bank Ltd and Mission Development Bank Ltd were among other losing stocks. On the earnings front, Citizen Bank International Ltd published its report for the four quarter, reporting a net profit of Rs 1,408 million – a 30.21 percent rise compared to the corresponding quarter last year. The bank's share price remained unchanged at Rs 224 per share during Sunday's trading. ARKS technical analysis model indicates market continuing its downfall with a bearish candle formation on the first trading day of the week. With the dip witnessed on the day, the market has closed near its immediate support of 1,180 points where a bounce can be expected. 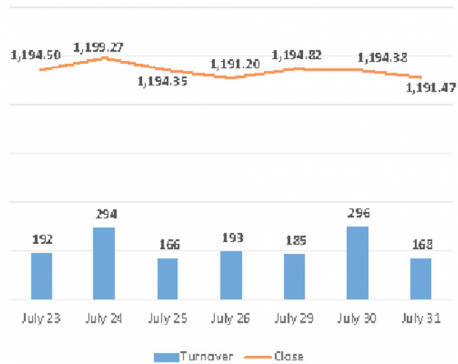 However, with the sluggish trading sessions witnessed recently and momentum indicators signaling lack of noteworthy thrust, the equity market is yet to show signs of recovery on a sustainable basis.